When the adjunct faculty decided to join a union, some students considered it an important event. But upon asking around campus, I found that there were quite a few other students who didn’t even know it had happened, nor why it was important. First, to address the most basic question: What does it mean to join a union? Unionizing means that adjuncts are paying a labor union a fraction of their salary for representation. Within a union, there are elected union officials, whose job requires them to pay attention to the politics of the university and how such things affect the adjunct faculty. 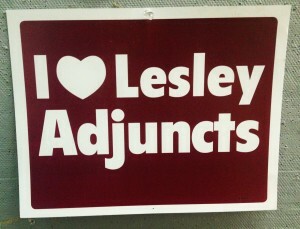 The Lesley adjuncts voted 359-67 to join Adjunct Action, a labor union involved with universities all over the country. Now, why did the adjuncts unionize? An adjunct faculty member is only paid specifically for the course(s) that they have been hired to teach, and consequently they very often receive no benefits, including health care, and no promise of a full-time job. Because adjuncts can be paid much less than faculty members who have signed contracts with the university, they represent a huge population of the faculty not only at Lesley, but at many universities. How does this affect the faculty and students? Of course, the adjuncts, and many of their students, are hoping that this “next phase” will involve increased benefits and higher pay.